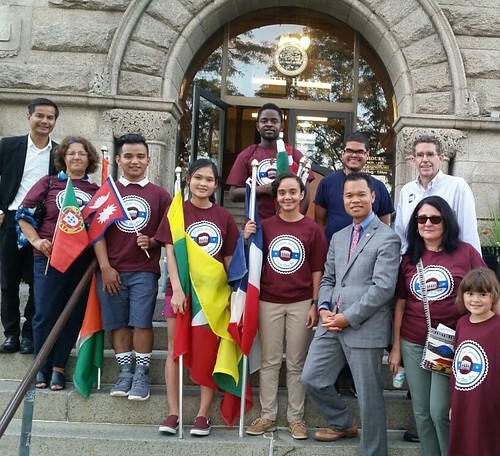 Congratulations to the organizers of the first-ever Welcoming Week Lowell which kicked off Friday night with a parade of flags that originated at different points around downtown and converged on the front steps of City Hall for a celebration of the city’s immigrant heritage. 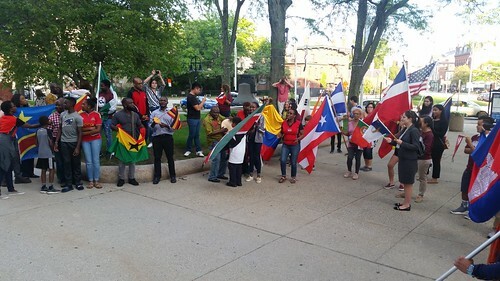 Events continued yesterday with a potluck picnic on the South Common and today with an Immigrant History Walk to be led by UMass Lowell Professor Bob Forrant (beginning at National Park Visitor Center, 246 Market Street, at 10 am today). For a full schedule of Welcoming Week Lowell events, check out the group’s Facebook page. 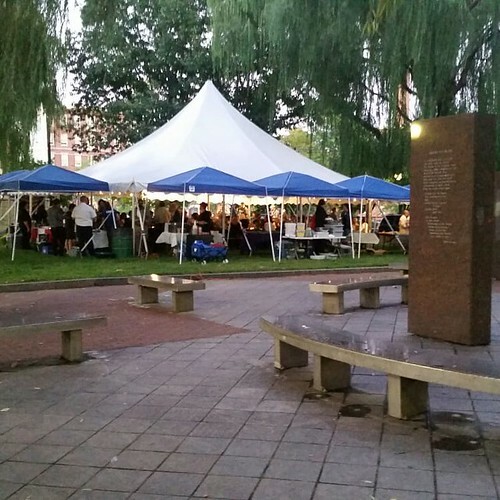 Another great event took place on Thursday night in Kerouac Park. Lowell Telecommunications Corporation hosted “Dinner in the Park,” an LTC fund raiser that featured food from Warp and Weft, Koshari Mama, Lowell Burger Co., Sizzling Kitchen, and Sub Zero Nitrogen Ice Cream along with beer and wine from local breweries and distributors and live jazz by the Luna Collective. All this took place under an open-sided tent set on the grassy rectangle of Kerouac Park. It was a great use of that Park which sometimes seems isolated from the rest of downtown. With 51 days to go until the election, the recount in the Third Congressional District Democratic Primary continues. Thus far, Lori Trahan has reportedly added a handful of votes to her lead. As I wrote last week, if both campaigns monitor the recount with equal diligence, it is unlikely that the result will change and she will be the nominee. The wildcard is Lowell, however, which will hand count its votes today. That’s because of the disproportionately large number of blank votes cast in the Congressional race in the city. Much of the commentary has stressed how unlikely it is that so many people opted not to vote in the heavily contested Congressional race. But I believe the bulk of those blank Congressional votes were cast in the precincts that make up the 18th Middlesex State Representative district. That’s where incumbent Rady Mom was challenged by Jim Leary, Sam Meas and Rithy Uong. I know that all four candidates worked very hard to turn out the voters who live in this district, many of whom may not have been the “dependable voters” (i.e., those who vote regularly) who were the target of all the Congressional campaigns. For that reason, I do find it plausible that the ballots were indeed left blank for the Congressional race. Still, it’s fortunate that there will be a hand recount to confirm that. I also know that when I voted that day at Ward 8, Precinct 3 which is part of the 18th Middlesex District, the vote counting machine that you normally feed your ballot into was not working. The police officer on duty at the ballot box instructed me to instead slip my ballot into a slot in the side of the ballot box. That left me wondering how the votes in that ballot box were counted, when, and by whom. And I voted at 7:20 am, shortly after the polls first opened, so it wasn’t like the machine wore out from overuse that day. That’s not the first time I have encountered a inoperable machine at that precinct. Regardless of the outcome of the recount, the reliability of the city’s voting machines is something the council should take up in the coming year. Even though Hurricane Florence was many hundreds of miles away and no direct threat to New England, the intense news coverage of the storm as it neared the Carolina coast got me thinking about the power of nature. I assume I was not alone in that. The remnant of the storm is expected to reach us Tuesday in the form of heavy rain. Then on Thursday afternoon, news broke of dozens of gas explosions and fires not far from here in Lawrence, Andover and North Andover. The cause was natural gas, but what caused the explosions and fires has still not been ascertained, nor have many residents who were evacuated been allowed back into their homes. We have harnessed the explosiveness and flammability of natural gas to heat our homes and water and cook our food. We expect it not to cause our houses to blow up. When it does, we deserve a full explanation.